James Charlie Sr., YKHC Honorary Board Member, and Gloria Simeon, YKHC Board Vice Chair, perform the ribbon cutting ceremony at the opening of the Yukon Kuskokwim Ayagnirvik Healing Center on January 11, 2017, surrounded by YKHC board members. People in the Yukon Kuskokwim Delta seeking treatment for alcohol addiction now have a newer, more spacious facility to help them. And with the new building, there is renewed hope for treating a disease that has long affected many lives in the region. 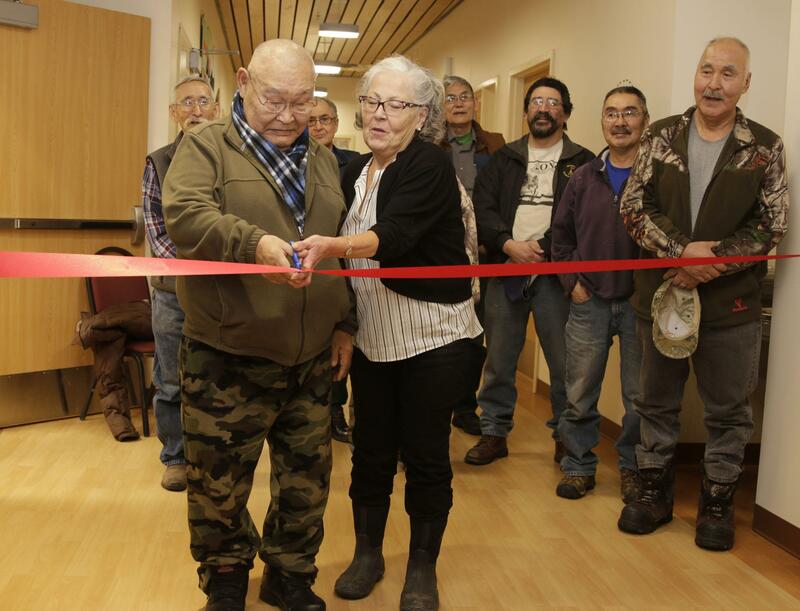 The Yukon Kuskokwim Health Corporation celebrated the opening of the Yukon Kuskokwim Ayagnirvik Healing Center on Wednesday. Ray Watson, Director of the Yukon Kuskokwim Ayagnirvik Healing Center, thanks all the employees who help guide patients toward recovery. Between the two open blades of a pair of scissors stretches a thick red ribbon across the hallway of the new Yukon Kuskokwim Ayagnirvik Healing Center. Holding the scissors are Gloria Simeon, YKHC Board Vice Chair, and James Charlie Sr., Honorary Board Member. The ribbon falls in half with one cut, and the two ends flutter to the new wooden floor of the approximately $12.8 million facility as the crowd applauds and cheers. At one end of the hallway are 16 beds for inpatient alcohol treatment as well as an exercise room, craft rooms, and a kitchen. Down the other end are rooms for outpatient counseling for both alcohol and opioid addiction. In the middle sits a small gym with a single basketball hoop. Here, dozens of community members and YKHC board members and employees are gathering to commemorate the building’s opening. Honorary Board Member James Charlie Sr. begins the ceremony with a prayer of thanksgiving. Gratitude and hope for a better future echoes throughout the morning’s speeches. Board members thank those who first began offering alcohol treatment in Bethel in the 1970s. Administrators thank the funders and construction workers who made the building possible. Ray Watson, Director of the Healing Center, thanks the employees filling the room, who every day guide patients toward recovery. 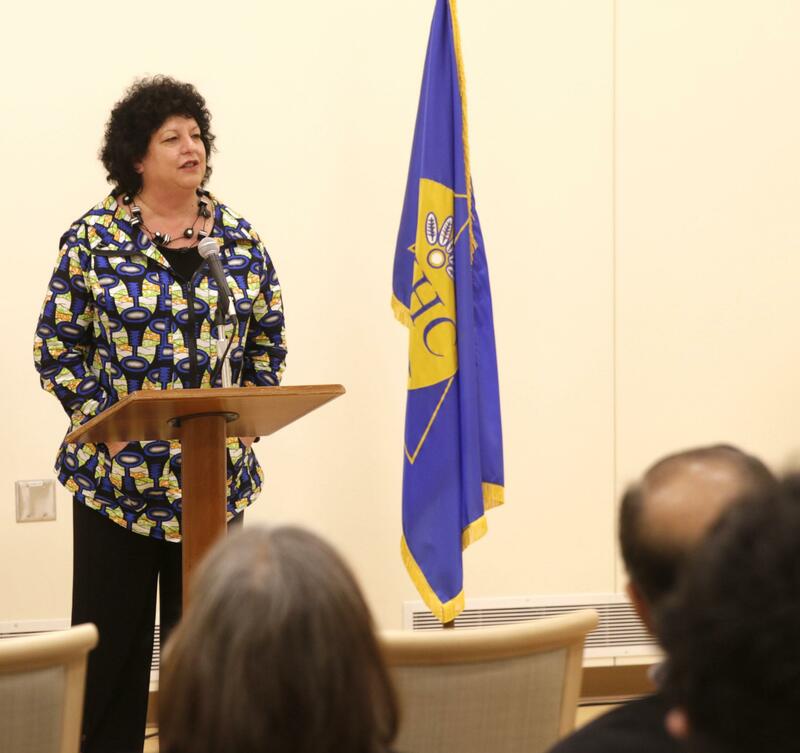 Diane Kaplan, President and CEO of the Rasmuson Foundation, addresses the crowd at the ribbon cutting ceremony at the Yukon Kuskokwim Ayagnirvik Healing Center on January 11, 2017. Watson knows this work well: first as a patient in the 1980s, then as a counselor, and now as the center’s director. “I always say the people who enter into counseling are the lucky ones, because there are so many out there who don’t have that, or at this point in time, they’re not there yet,” Watson said. Many speakers noted that everyone in the Delta knows someone in the region who struggles with alcohol or drugs. They might even one day seek treatment themselves. The facility actually opened six weeks ago. Watson said the patients were sent on a ‘outing’ for the ribbon cutting to protect their confidentiality. But after the ribbon is thrown away, the cake eaten, and the balloons taken out, those patients will return. They may have to come back again. And again, if they relapse. This new center, located behind the Bethel post office, was set to open a couple years ago. But in October of 2014, the partially constructed building caught fire and burned to the ground. Construction began again. Diane Kaplan is the President and CEO of the Rasmuson Foundation, one of the building’s funders. She said that the fire and rebuilding can be seen as a metaphor for recovery. But as Director Watson said and can attest, recovery, like the new building, is possible. 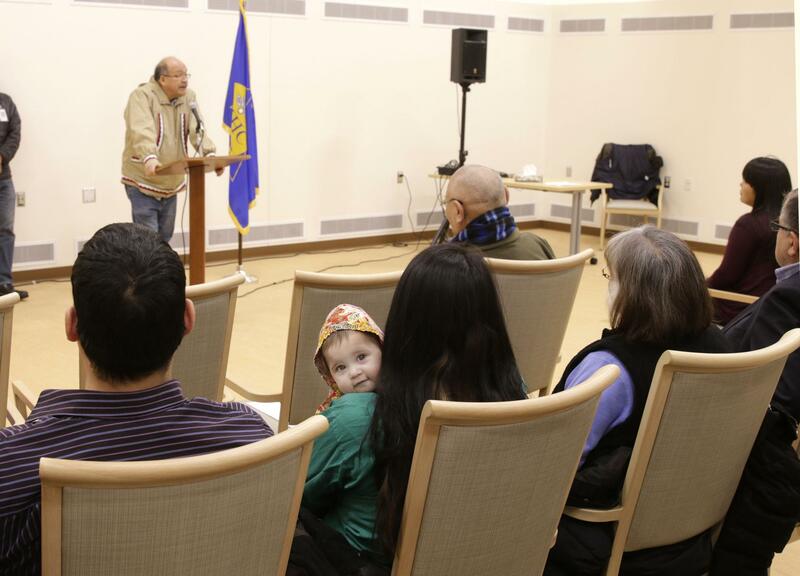 The Yukon Kuskokwim Ayagnirvik Healing Center celebrated its opening on January 11, 2017.